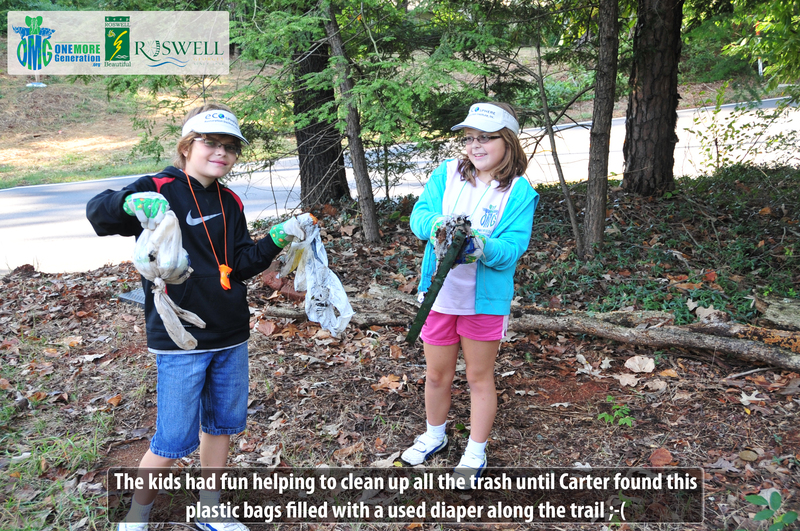 Olivia and Carter often get asked why they do what they do and what makes them think that they can make a difference in our world. Their answer is usually the same… “We can either sit around and wait for someone to help fix some of the problems around us, or we can stand up and be that someone.” If your looking for something you can do to make an immediate difference, here is something you might consider doing in your community which will definitely make a difference, and all that it costs you is one day out of your busy schedule. As we learn more and more about the affects of plastic pollution on our environment and on the many species that share this earth with us, we have become more aware of how much trash is just lying around in our community. If you take the time to look, you too will be amazed to see how much trash we are just throwing on the ground. Now that we are teaching our “Plastic Awareness Week” curriculum program at schools, churches and other community events, we can not stop noticing how bad the problem really is. We have to leave for Carter’s soccer practice 15-minutes earlier now because the kids automatically stop and pick up every piece of trash they see along the way from the car, to the practice field. The same applies for when we go shopping or when Olivia goes to swim practice, it doesn’t matter where we are or where we are going, the kids instinctively bend over and pick up trash… which is not a bad thing, it just means it takes us longer to get anywhere. So that got us thinking. 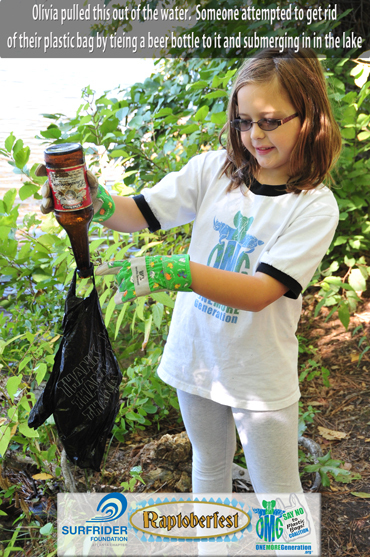 If more people where to stop and pick up some of the trash, there would be less trash on the ground and everyone could be proud of their community again. 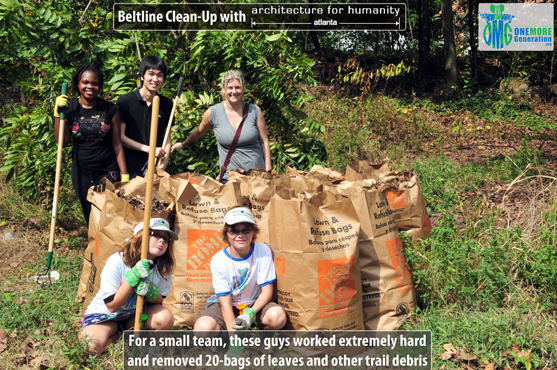 So we started looking into what we could do to help in our community and we found several local clean-up events being hosted throughout the greater Atlanta area. 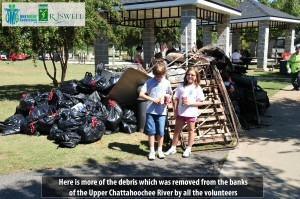 We asked the kids if they would mind participating in one of the events and they quickly said yes, so we made contact with the folks in Roswell GA who hosted the ‘21st Annual North Fulton Rivers Alive Festival & Clean-up‘ and they invited us to help out at their annual community clean-up event. 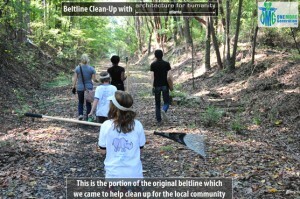 So that Saturday, we spent about 5-hours helping to clean up the community. 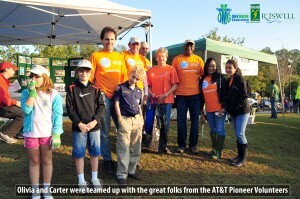 The event was very large, they had hundreds of volunteers who showed up to help. Everyone seemed excited to be part of the event and we heard no one complain about anything. Carter and Olivia were also excited to be part of the event and the sense of accomplishment and satisfaction they experienced was ‘priceless‘. We were teamed up with a great group of folks from AT&T who provide this service to this community every year. As we walked around the designated area, we were amazed at all the things we would find. Plastic bags and plastic water bottles were among the most prevalent and beer bottles and cans came in second place. The kids had a great time and we know we made a difference. On Sunday we decided to take part in another event with a local group who adopted a portion of the old ‘beltline’ around Atlanta. This clean up was a little different. 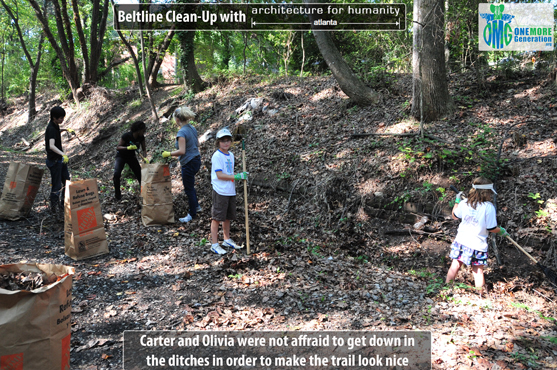 Our task for this event was to try and remove as much of the leaves and dead branches etc., we could from a section of the beltline trail so community members could safely enjoy walking through this scenic section of town. The group we partnered with is the Architecture for Humanity Atlanta Chapter and the volunteers were fantastic to work with. Olivia and Carter worked very hard and the team we worked with made sure to make our two young founders felt like they were part of the team. We still found plenty of plastic bags and bottles along the way and it just goes to show you that plastic trash is everywhere. When we were through, Carter commented on the fact that he enjoyed the clean up and he was confident the folks who stroll down the path in the coming days, will be able to do so more safely and without having to look at trash everywhere. Although this clean-up event was on a smaller scale as the one we attended the day before, the personal satisfaction we experienced at the end of the day was no less. It is almost scary to think that all this trash is around us and we usually never notice. We are all so caught up in our daily routine that we tend to overlook what is right in front of us. Next time you drive to work or drive your kids to soccer practice or to the library etc, try and make a conscious effort to look at the ground along the way. Look at the sides of the roadway or path and see if you can count how many pieces of trash you notice along the way. I assure you, it will be far more than you ever expected. Since the kids thoroughly enjoyed the clean-up events we participated in, we decided to try and fit in one more event this past weekend (between soccer games) so we attended the Raptoberfest Clean-Up which was being hosted by our friends over at the Atlanta Chapter of the Surfrider Foundation. 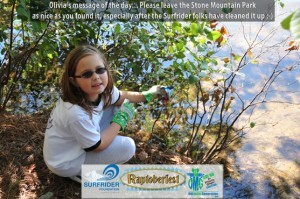 The event was conducted at beautiful Stone Mountain Park and the folks from Surfrider came out in force. They even brought an entire contingent of members who brought their paddle-boards in an effort to make sure the lake was cleaned up along the way. We had a great time working with the Surfrider folks and Olivia is now asking if she too can someday test her skills on a paddle-board. If you live in the Atlanta area and are looking to join up with a great group of people who are sincere about wanting to clean up our environment, then I suggest you contact the Atlanta Surfrider folks. 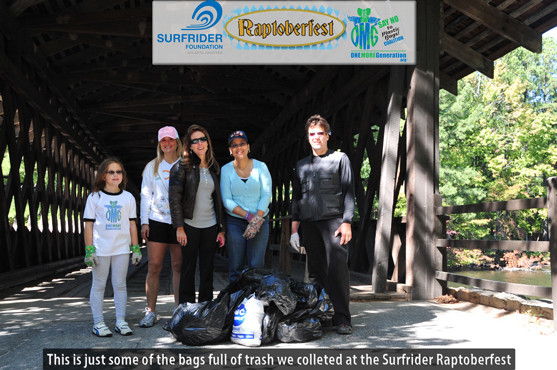 If you live outside the area, be sure and look Surfrider’s website to find the closest chapter near you. You will be glad you did. BTW, if your interested in getting involved in your community, look up your local Keep America Beautiful or contact your local community center to see what is scheduled in your area. 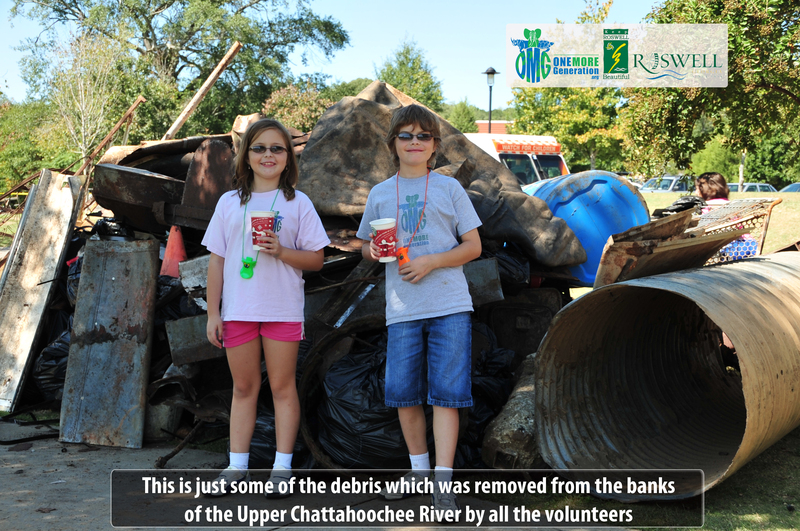 If you live in the greater Atlanta area, you can look up the registered Clean-up events at the River Alive site which lists more events that you can shake a stick at. It truly only takes ‘one day’ to make a difference and the satisfaction that you and your family helped to clean up your community will be worth every minute of it. We hope to see you out at one of the future events real soon and be sure to keep your eye out for Carter and Olivia, you never know where they will be helping out next. 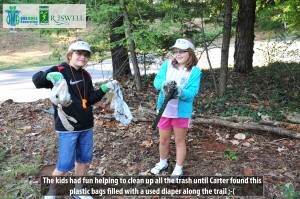 Olivia and Carter started their organization in an effort to help save endangered species, and that is still their main motivation but they also realized that you can not save any animals unless you also care about our environment. Whatever your passion may be, please consider helping at a clean-up event in your community… you will be glad you did.